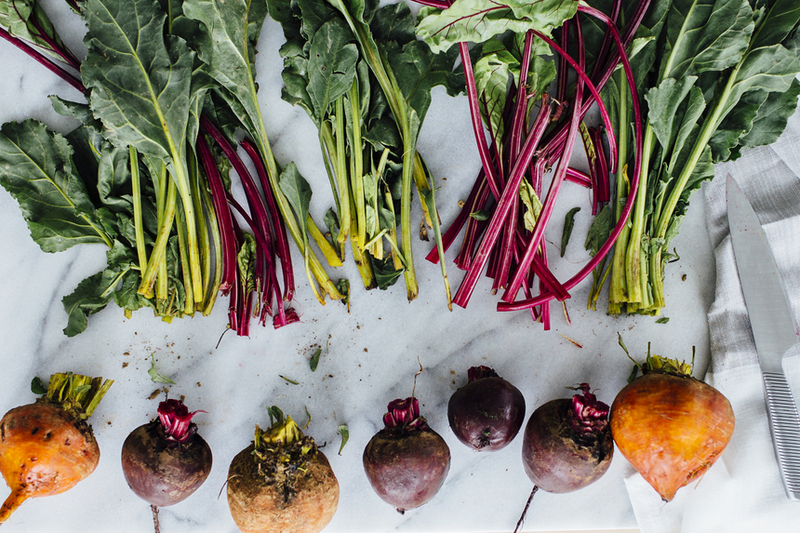 GIF Tutorial: How to Prep & Cook Beets – What’s for Dinner? 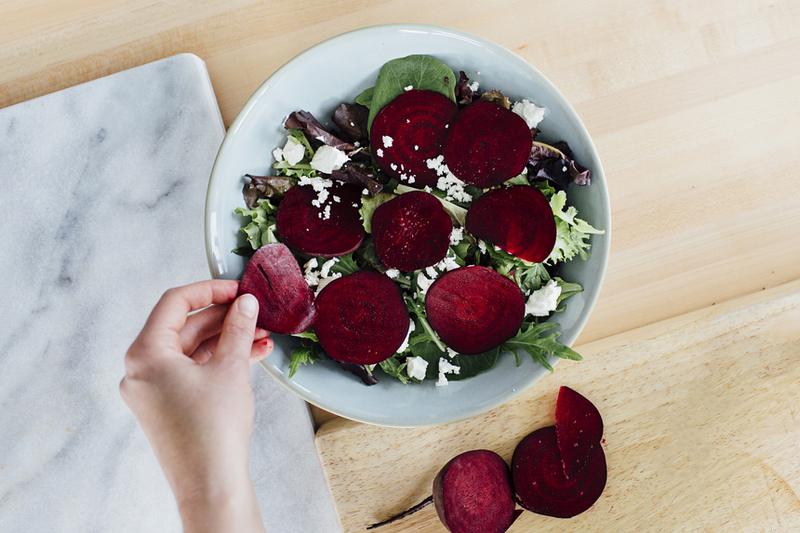 Beneath a beet’s rough exterior lies a jewel-toned veggie, bursting with fiber, vitamins, and powerful antioxidants. Whether you pick intense red, mild golden, or candy-striped Chiogga beets, you’ll find that these tasty tubers make a sensational addition to salads, sandwiches, soups, and more. Step 1: Slice off the beet greens (if attached) with a sharp knife and save them for later. Step 2: Scrub the beets under running water with a vegetable brush. Step 3: Carefully cut off the ends of the beets. 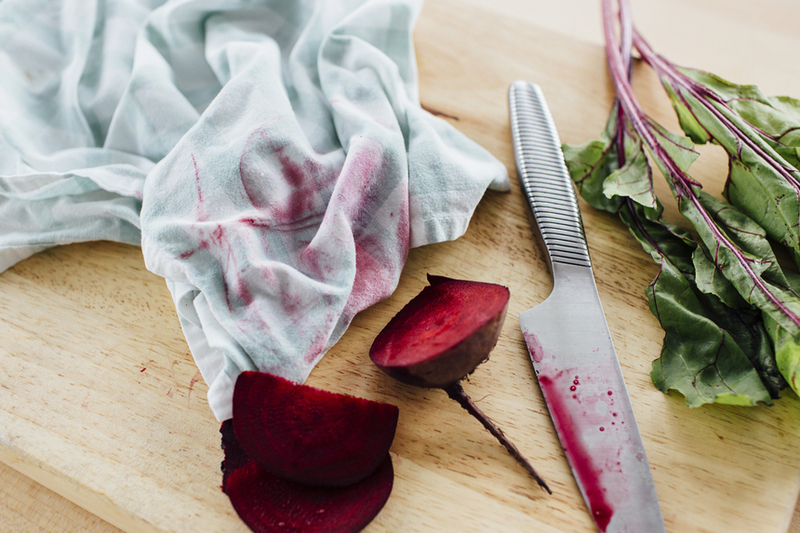 Remember beet juice can stain your hands, wooden and plastic cutting boards, and kitchen towels. Step 4: Peel off tough skin with a vegetable peeler. If you’re roasting beets whole, you can skip this step. Shred the peeled beets with a box grater or thinly slice with a sharp knife or mandoline. 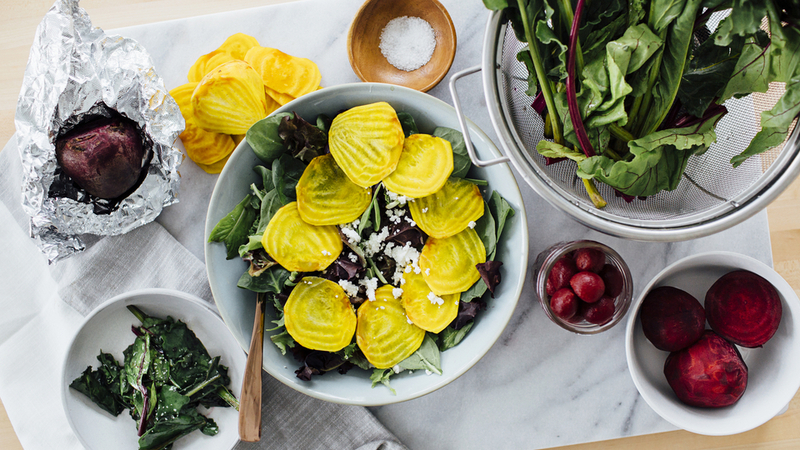 Make salads shine. Shredded or spiralized beets make a colorful addition to salads, veggie wraps, and sandwiches. Drink your veggies. Put raw beets through an electric juicer for a vibrant, rich, homemade juice blend. Capture the color. Beet juice can be used as a natural dye for frosting, cookies, pickled eggs, or textiles. Wrap each individual beet, whole and unpeeled, in a sheet of aluminum foil. Bake at 450°F on a sheet pan, or directly on the oven racks, for 30-40 minutes, until tender. The beets should be easy to pierce with a knife. Once they’re cool enough to handle, you can rub off the skins, wearing latex gloves (to prevent stains on your skin). Peel the beets, then chop them into bite-size pieces. Toss with olive oil, salt, pepper, and herbs (rosemary, sage, and marjoram all work well) on a baking sheet. Bake at 400°F for 30-40 minutes, until tender. Shake the baking sheet several times during cooking to help prevent sticking. Turn up tacos. Roasted beets make a tasty addition to vegetarian tacos, especially breakfast tacos with beans, cheese, and sour cream. 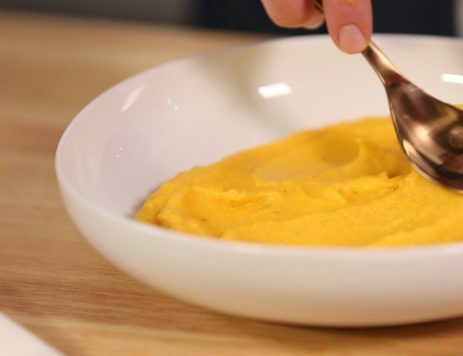 Make a Middle Eastern side dish. Shred roasted beets and add a few tablespoons of creamy tahini, a squeeze of fresh lemon juice, a sprinkle of salt, and a handful of chopped Italian parsley. Bring a full pot of salted water, plus a teaspoon of white vinegar, to a boil. Alternatively, place a large steaming basket over a pot of water and bring to a boil. 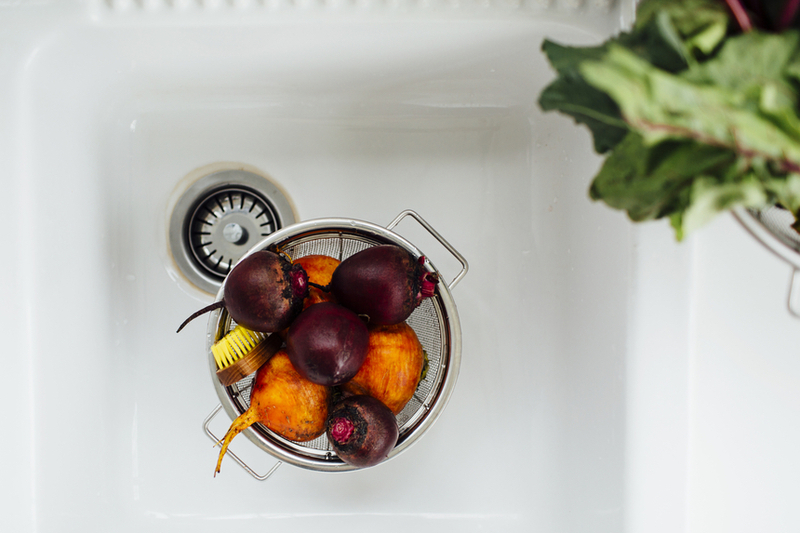 Add whole, unpeeled raw beets carefully into the boiling water or steamer. Cover and lower the heat. Simmer or steam between 35 to 60 minutes, depending on their size. The beets are done when they can be pierced easily with a knife. Remove skins as described in the whole roasting method. Punch up potato salads. The deep sweetness of beets plays nicely with fingerling potatoes, bell peppers, and asparagus. Pack a jar of pickles. Combine 1/2 cup white vinegar with 1/4 cup sugar and a few dashes of salt and gently boil for about 5 minutes. Remove from the heat and add 1/2-1 teaspoon whole black peppercorns and a few dried bay leaves. Once cool, pour the whole mixture over a pound of sliced, boiled beets in a jar (add water if necessary to fill liquid to the top) and chill. Pickles will be ready in 4-7 days, and will keep for a few months in the fridge. Brighten up your bagel. Thin-sliced boiled or steamed beets make a lovely addition to a bagel with cream cheese and smoked salmon. 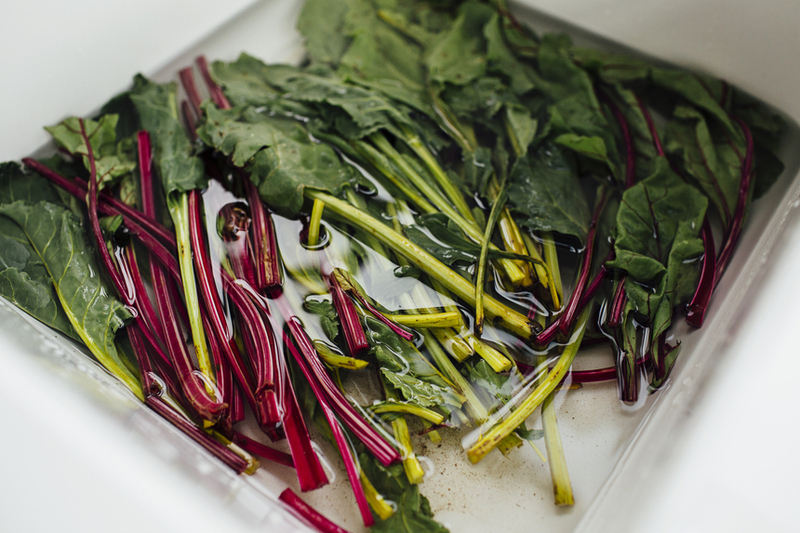 Remove beet greens from the thick stalks and soak them in a bowl of cold water, swishing to remove sand or dirt. 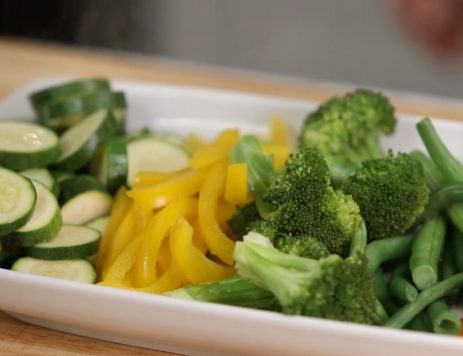 Then, spin greens dry using a salad spinner. Sauté greens in olive oil with garlic, salt, and red pepper flakes for a side dish. Toss them into a frittata, pasta, or anywhere you’d use wilted spinach or arugula. Add to a roast pork or eggplant parm sandwich.